What does “Bazinga” mean? | Why Do We Do It? Well put simple, “Bazinga” is considered to be Sheldon’s variation of “Zing”. This entry was posted on March 7, 2011 by Avi. 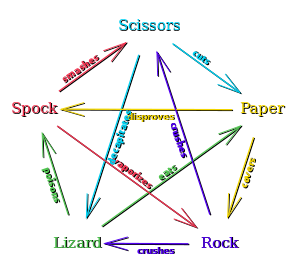 It was filed under 2011, March and was tagged with Big Bang, Big Bang Theory, game, Hand Games, Lizard, New York Times, Recreation, Rock paper scissors lizard spock, Rock-paper-scissors, Sheldon, Sheldon Cooper, Sheldon Lee Cooper, Spock, TBBT, The Big Bang Theory.